The newspaper was established in 1842, less than 50 years after Moses Cleaveland landed on the banks of the Cuyahoga River in The Flats, and is currently owned by Advance Publications (Newhouse Newspapers). The Plain Dealer Publishing Company is under the direction of Virginia Wang (general manager). The paper employs over 700 people. 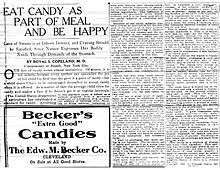 On October 8, 1922, The Plain Dealer, published an article written Royal S. Copeland telling Clevelanders to "Eat Candy as a Part of Your Daily Meal and Enjoy the Best of Health." The Plain Dealer has been criticized by liberal columnists for staking out generally conservative positions on its editorial page, despite serving a predominantly Democratic readership base. In 2004, the editorial board voted to endorse John Kerry; after publisher Alex Machaskee overruled it, ordering the board to write an endorsement of George W. Bush, editorial page editor Brent Larkin managed to talk Machaskee into withholding an endorsement. 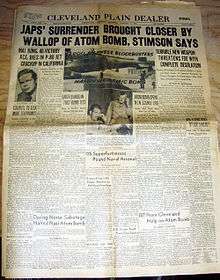 The news coverage is generally more neutral, with national and international news often culled from wire services, including the New York Times'. The Plain Dealer is the major news contributor to cleveland.com, the regional news, event and communication portal run by Advance Digital via Northeast Ohio Media Group. The paper does not operate its own editorial website. Northeast Ohio Media Group runs a separate website for the business side of the newspaper, including advertising. cleveland.com also features news from the Sun Newspapers, which are a group of smaller, weekly, more suburban-oriented newspapers in the Greater Cleveland metro area also owned by Advance Publications. The Sun Newspapers are the largest chain of paid weekly newspapers in the country. The quality of the site (as well as other Advance Internet sites) is regularly criticized by the staff, newsroom staff and locals. The website was recently redesigned as a result. ↑ Columbia Journalism Review (2005). Who Owns What. Retrieved June 5, 2006. ↑ Cleveland: Confused City on a See-saw (Electronic Edition). Philip W. Porter, 1976. Pages 234–235. ↑ Cleveland: Confused City on a See-saw (Electronic Edition). Philip W. Porter, 1976. Page 10. ↑ "The Plain Dealer kills off Sunday Magazine", Editor and Publisher, December 2005. ↑ Robert L. Smith (December 11, 2012). "Newspaper Guild endorses labor agreement with The Plain Dealer". Archived from the original on January 15, 2013. ↑ Robert L. Smith (July 31, 2013). "The Plain Dealer executes newsroom layoffs as era of daily delivery nears end". ↑ The Pulitzer Prizes (2005) . Retrieved June 5, 2006. ↑ "It's Time To Do What Feels Right", Connie Schultz, February 16, 2006. . Retrieved June 5, 2006. ↑ "Plain Dealer photo staff named best in Ohio 11th straight year". Retrieved 7 November 2014. ↑ Ewinger, James. "The Plain Dealer's Gus Chan named Ohio news photographer of the year; staff named best in state". Retrieved 7 November 2014. ↑ "PD AP awards" (PDF). Retrieved 2014-04-30. ↑ "PD AP awards" (PDF). Associated Press. Retrieved 2014-04-30. 1 2 "Dear Readers: Information about The Plain Dealer's delivery schedule". The Plain Dealer. May 21, 2013. Retrieved May 27, 2013. ↑ "Profile page, Washington bureau chief Stephen Koff". Retrieved 7 November 2014. ↑ "Profile page, Columbus bureau chief Robert Higgs". Retrieved 7 November 2014. ↑ "PD Changes" (PDF). Cleveland Plain Dealer. June 29, 2008. Retrieved 2008-07-12. ↑ The power of a publisher. ↑ Cool Cleveland on PD and Voinovich. ↑ "WHO HAS YOUR BACK? Journalism in the Corporate Age", Columbia Journalism Review, September 2005. ↑ "Keeping reporters' notes out of court", The American Editor, August 2005 – October 2005, FREEDOM OF INFORMATION. Pam Luecke, Author. ↑ Wakin, Daniel J. (September 25, 2008). "Music Critic vs. Maestro: One Loses His Beat". The New York Times. Retrieved 2008-09-28. ↑ Lebrecht, Norman (February 12, 2004). "Franz Welser-Möst – The conductor they loved to hate". La Scena Musicale. Retrieved 2007-09-04. ↑ "Plain Dealer reporter drops all but one claim against paper". The Plain Dealer. 28 January 2009. Retrieved 2010-05-17. ↑ Wakin, Daniel J. (6 August 2010). "Cleveland Critic Loses in Suit Over Job Change". New York Times. Retrieved 2010-12-20. 1 2 3 McCarty, James F. (March 27, 2010). "Anonymous online comments are linked to the personal e-mail account of Cuyahoga County Common Pleas Judge Shirley Strickland Saffold". The Plain Dealer. Retrieved January 4, 2011. 1 2 Atassi, Leila (April 8, 2010). "Cuyahoga County Judge Shirley Strickland Saffold files $50 million lawsuit against The Plain Dealer and others". The Plain Dealer. Retrieved January 4, 2011. ↑ Farkas, Karen (April 22, 2010). "Judge Shirley Strickland Saffold is removed from the Anthony Sowell murder trial". The Plain Dealer. Retrieved January 4, 2011. 1 2 "Saffolds dismiss lawsuit against Plain Dealer, settle with Advance Internet". The Plain Dealer. December 31, 2010. Retrieved January 4, 2011. ↑ Gomez, Henry. "Gov. John Kasich ignores Ed FitzGerald in their only meeting of election season: 5 observations". Northeast Ohio Media Group. Retrieved 7 November 2014. ↑ Mismas, Joseph. "PD Pulls Video Of Kasich Refusing To Answer Editorial Board Questions". Retrieved 7 November 2014. ↑ Cushing, Tim. "Cleveland Plain Dealer Owner Demands Takedown Of Unflattering Video Featuring Candidate It Endorsed In Governor's Race". Retrieved 7 November 2014. ↑ Jackson, Tom. "PD silent on debate video". Sandusky Register. Retrieved 7 November 2014. ↑ Castele, Nick. "The Only Video of Kasich and FitzGerald Debating Isn't Online Anymore. What Happened?". Retrieved 7 November 2014. ↑ Rosen, Jay. "Chris Quinn, vice president for content at the Northeast Ohio Media Group… What's up?". Retrieved 7 November 2014. ↑ Marx, Greg. "News executives need to explain why video of an Ohio campaign interview disappeared". Columbia Journalism Review. Retrieved 7 November 2014. ↑ Diadiun, Ted. "Here's why Chris Quinn took down the interview video of John Kasich, Ed FitzGerald and Anita Rios: Ted Diadiun". Northeast Ohio Media Group. Retrieved 7 November 2014. ↑ Zimon, Jill Miller. "NEOMG Finally Publishes Its Explanation, Apology For Chris Quinn's Video Removal Decision". Retrieved 7 November 2014. ↑ Allard, Sam. "Finally, Poorly, the NEOMG Explains the Kasich Video Debacle and Chris Quinn's "Error in Judgement"". Cleveland Scene. Retrieved 7 November 2014. ↑ "About us – Cleveland.com"
↑ "The Plain Dealer drops PolitiFact, but keeps on factchecking". Columbia Journalism Review. Retrieved 7 November 2014.